Readers have been deluging me with SARS information links. Thank you. It doesn’t make sense for me to add all of them to the carefully chosen list of links in the sidebar, and I don’t have time to write a descriptions for all of them. However, I wanted to share them, so I have created this separate page for them, which I will update irregularly. US State health departments In the US, for all the visibility the CDC gets, public heath is very much a local matter. CDC’s Guideline for Hand Hygiene These are the result of long study. The report concludes that it is ok to use alcohol hand rubs, especially it that means health care workers actually do practice good hand hygiene. Google News SARS stories best place to find SARS stories in English from around the world, although there is a strong bias towards US news stories. SARS Early Release page of the New England Journal of Medicine. 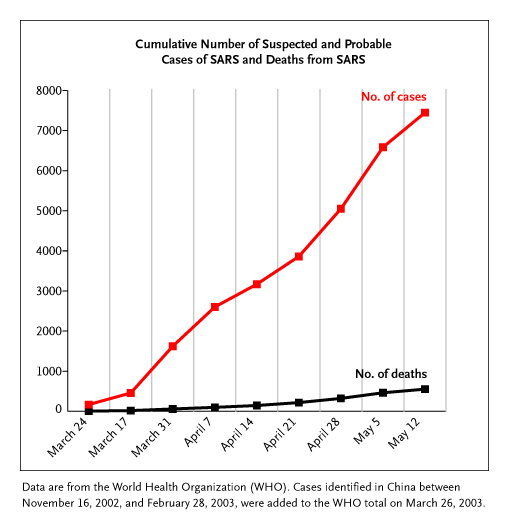 The Lancet British medical journal with some reports on SARS. The British Medical Journal. Several articles on SARS. SARS Watch was their website of the week one week. Krisalis, a Singapore weblog written by somebody born in Texas, USA to British parents. She occasionally has pithy things to say about SARS in Singapore. SARS Graph from the New England Journal of Medicine. The WHO posted a series of epidemiological curves, but hasn’t been very good at keeping them up to date. Large Hong Kong based SARS mailing list set up soon after the first day of outbreak. SARS entry in the Wikipedia. Wikipedia is the open source encyclopedia, where anyone can contribute. The quality of contributions can vary widely. The page on SARS is well done. SARS Reference The first book on SARS. A free 62 page medical reference book with chapters on the history, virology, transmission, epidemiology, diagnosis and treatment of SARS. Heavily footnoted with links. Authors say they will update monthly. How SARS Works from the How Stuff Works website. As of May 2003, it was a reasonable introduction to SARS, written at a high school level. Medline’s Encylopedia a good starting point for laypeople trying to understand medical terminilogy. The Merck Manual of Diagnosis and Therapy is one of the best places to find short summaries of diseases and their treatements. The Merck Manual — Home Edition is one of the best places to find summaries of diseases that laypeople can understand without doing a lot of work. We have the paper one at home. Who is linking to SARS Watch org? Courtesy of David Sifry of Technorati.